Treat your family and friends to the perfect gift. 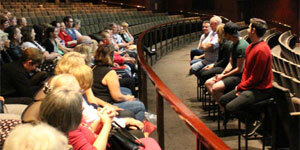 They will be spoiled for choice with a wide selection of shows at QPAC. Whether they enjoy blockbuster musicals, splendid opera, gripping drama or family entertainment, a QPAC gift voucher is the perfect gift for every arts lover. And as gift vouchers are valid for 12 months, there is the added bonus of the flexibility to find a gift from the full range of productions during the entire year. Gift vouchers can be redeemed online at qpac.com.au or qtix.com.au, over the phone (call QTIX on 136 246) or upon presentation at the QTIX Box Office at QPAC. Refer to full terms and conditions. Please note gift vouchers are redeemable for tickets only, not food and beverage, merchandise or other purchases.